Light of Day Canada appreciates all of the community support through sponsorship, attendance, volunteering and donations! 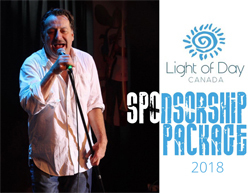 If your business is looking to get involved in the fight against Parkinson's disease please take a look at the NEW 2018 Sponsorship Package (click on image) and email us at support@lightofdaycanada.com to become part of the #LODTeam! Thank you to all of the sponsors in Hamilton, Toronto, Kingston and Niagara over the past 10 years. Your support has helped make Light of Day Canada a great success! Please take a moment to click on the links below to visit our current 2018 sponsors!